Always curious for this small eatery in town and finally had the chance to tried. Had their Baja bowl with chicken and spicy chicken. Every mains ordered comes with a pack of nachos with free flow of salsa toppings for it. The variety for salsa toppings was quite a fair bit with tomato salsa as my top favourite. The serving for Baja bowl was quite huge and I had difficulty finishing one. They contains alots of healthy ingredients such as fresh vegetables and black beans topped on mixed grains. For those who cannot take spicy food, please do not try their spicy chicken. The normal chicken was already covered with black pepper. Recommend for those who wants to try something new. 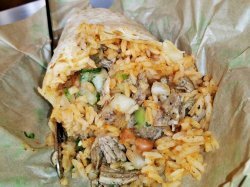 First established in 1990 in California, on the west coast of the United States Of America, Baja Fresh Mexican Grill, also known as Baja Fresh for short, is a fast casual / fast food restaurant, specialising in Tex-Mex / fusion Texan and Mexican food. 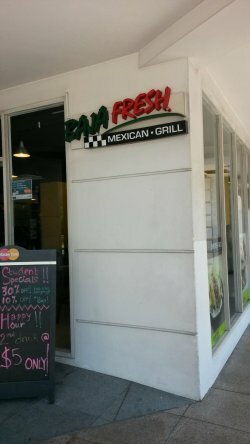 Baja Fresh Mexican Grill is known for their use of fresh ingredients, and their self-serve salsa bar with a variety of freshly made salsa. 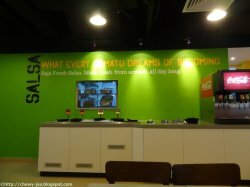 While the American outlets have seen declining success in recent years, the Baja Fresh Mexican Grill in Singapore, which opened in May 2012, is still doing rather well. Ambience at Baja Fresh Mexican Grill is simple, casual, and functional. There is minimal decor to speak off, but the bright colours of green, yellow, and white lend a cheery feel. Furniture is functional and bare, similar to other fast food franchises. I do feel that cleanliness level overall isn't that great, the places shows signs of age, and the lights are slightly dim. Seats are also somewhat limited. 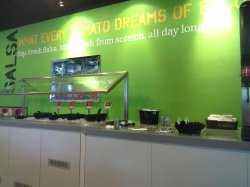 Service at Baja Fresh Mexican Grill is largely self-service, with ordering and payment done over the counter, similar to other fast food outlets. 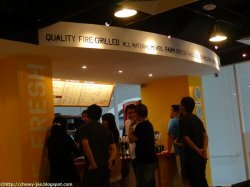 However, as there is usually a short 5 - 10 minute wait for your orders, staff will serve it to your table. The menu is clear and legible, though the amount of customisable options is wide, and can therefore slow down the queue. While staff do make suggestions on what to order, they can be somewhat brusque. 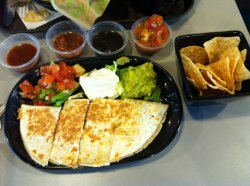 Food at Baja Fresh Mexican Grill is classic Tex-Mex, known for its use of shredded cheese, beef / pork, and beans. Generally, I find the food to be tasty and well seasoned, balanced in the meals, though the meat is sometimes lacking in moisture. Portions are large, and very filling. Prices are comparable to a high-end bistro / restaurant, depite its casual ambience. Budget about SGD $25 per person for a meal here. 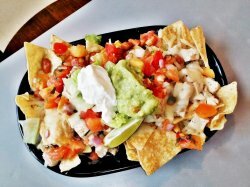 The Nachos (SGD $12.95) features a large basket of crisp tortilla chips, topped with tomato salsa, pinto beans, guacamole, sour cream, melted cheese, and chunks of chicken breast. Love the combination of flavours and textures, the fresh and sweet tomato salsa, the crunch of the salty tortilla chips, the savoury chicken, the smooth gucamole, and the tangy sour cream. Good enough to be a meal on its own! Fresh and delicious Maxican food! 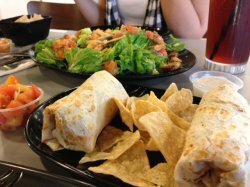 Baja Fresh is a US based Mexican grill food chain and has been serving Mexican grill food for decades. We are thankful we got the chance to experience both the Baja Fresh home-delivery and on-site tasting treat. Tacos is a traditional Mexican food, made of a corn or wheat tortilla filled with various proteins, vegetables and cheese, usually go with guacamole, salsa. 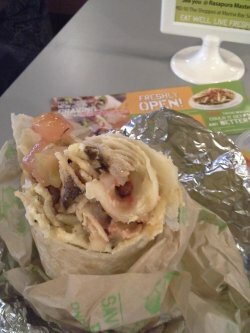 Another interesting wrap but eat without wrapping the tortilla. 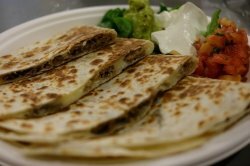 A quesadilla is a flour tortilla or a corn tortilla filled with cheese and/or vegetables. Don’t let its plain look deceive you; this is easily one of the tastiest dishes we’ve had in a while. 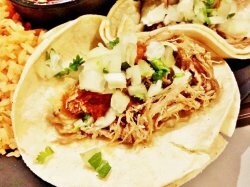 The grilled flour tortilla was held together with Monterey Jack Cheese and slow cooked American style pulled Pork Carnitas. The pork was exceptionally tender and seasoned it formed the perfect blend with the cheese – each bite was fireworks in the mouth! It’s served with sour cream, guacamole and pico de gallo but we guarantee the sauces are just an extra bonus and really not needed. 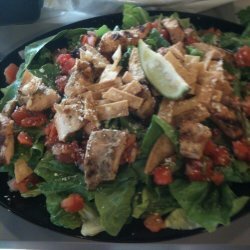 One thing we love about Baja Fresh is that they really live up to their name in terms of the freshness of the foods and it really shows through the salad. 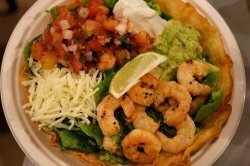 The greens were fresh, and paired with beans, cheese, guacamole, sour cream, salsa and some prawns! The crispy tortilla shell gave the whole dish an extra kick too, perfect for those looking for a light and guilt-free meal! 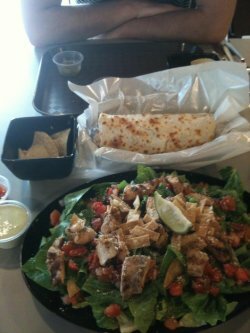 While Quesadilla was well loved by all, the Tostada Salad, Burritos and the Tacos were equally enticing! 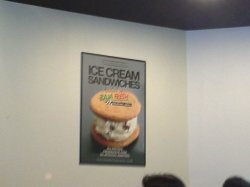 Please refer to www.ieatandeat.com for details review. Always been curious on the food served here whenever I passed by this restaurant. Finally decided to check it out on this afternoon. Restaurant is quite cosy and comfortable, with simple furnishings. I think this restaurant is owned by Indians as all staffs here are all Indian. Paid $5.95 for this single tacos which to me was extremely expensive. Very small portion and in two to three bites can be completed. Americano style wrap which is similar to prata is chewy but tasteless. Chicken meat was tough and very little portion. Totally not flavourful. I had burrito breakfast at Rendozvous Gallery. 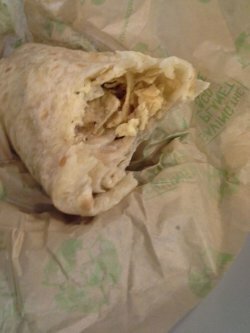 it is a 8 inch burrito wrap with tortilla filled with scrambled eggs, melted cheese, baja papas. The roll is very thick and rolled with scrambled egg. 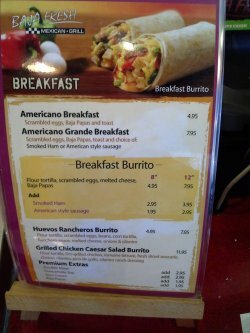 I can eat the scrambled egg and baja papas for every bite. However, I don't taste of cheesy. I had to add pickle for each bite. The breakfast is very filling It costs $4.95. Till noon, I still do not still hungry. The restaurant is very clean. There is a corner where customers can pick their choice of pickle. The waitress was very courteous. My hub loves Mexican cuisine and its tough to find places that serve decent burritos and tacos. So when I read that this place serves pretty good stuff, must treat Hub to meal. 1) Cheese Nachos - this is delightful as nachos and melted cheese really works. Topped with tomato bits, guacamole sauce and sour cream, very very delightful. 2) Fajitas - I opted for the pork version and it comes with 4 steaming soft tacos and a platter of pulled pork and rice. My daughter was happily DIY-ing her own dinner. 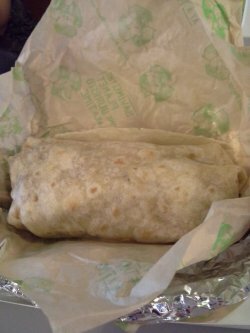 4) Chicken Burrito - first of all...it's massive! And I love the size. Taste-wise, it's actually quite good. One of the better ones I've tasted in Singapore. And after 6 beers and many drinks, we were still unable to finish our food! Had to roll out eventually. Hub love it here!!! 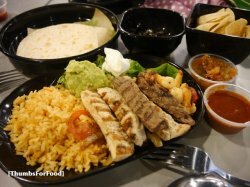 I've always had a thing for mexican food, but it isn't really easy to find affordable and authentic mexican food here in singapore! We decided to try Baja Fresh to check the place out!! We didn't really have an elaborate meal, and the food wasn't really very filling, but it was still not too bad!! I had some quaesidillas with shrimps and it was really really nice but just too little! The avocado is really fresh over at Baja Fresh! 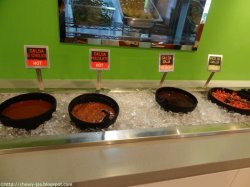 Also, as you will see from the photos, they have free-flow salsas over there and some are really tasty! If you're hungry, go for the burrito! Filled, with rice, it will definitely fill you up! After dance class, as always... I was starving. So, I messaged my friends to meet up at Baja Fresh and have an early dinner. At that time, they had this promotion. For only $20, you get one platter of salad, 2 burrittos, and quesadillas.The serving was big enough for 2. Since there were four of us, we ordered two of these combos. As always, there were free nachos served. For the salsa, you can freely take from the "dips section". The nachos remained their crispiness. By the time the orders arrived, I was half full from munching on these. The salad was fresh and I loved the prawns which were topped on the greens. They were a bit burnt which gave that smokey and flavour. It went well with the dressing. For the burritto, it was small and was just the perfect size for me. Thankfully, there were no beans nor rice inside so I was able to finish this. I enjoyed the quesadilla and I even finished two slices even if I was already full. The combo was very filling and I felt that it can be shared among three people. 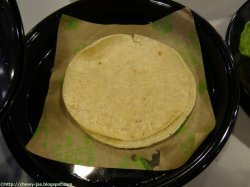 I caught up with the recent craze over all things Mexican and tried Baja Fresh. 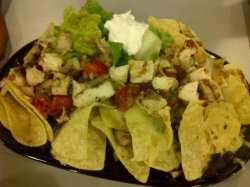 I tried the grilled chicken nachos and I must say I find it very very tasty. The grilled chicken was grilled to perfection. It was not too hard (grilled too long) or too soft (under-grilled). The chicken meat was succulent and tender, with the spices obvious in every bite. The nachos itself were very crispy and tasty. Will be back for sure! Mexican in fast food style! I love the depth of flavours in this cuisine and the fresh seafood blended in with all the spices. But, it is kind of sad because in Singapore, Mexican food is not exactly affordable. 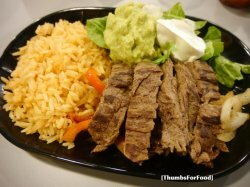 For a review on Mexican food, please visit our post on Viva Mexico! 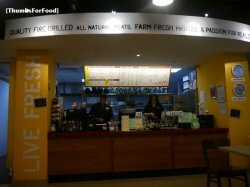 But before you head over to read, continue on our review on Baja Fresh! Steak Fajitas $14.95. Honestly, I was pretty disappointed that it came in a plate. I was kind of expecting the hot sizzling Fajitas that give off the alluring smoke of fragrance from afar. Well, and then I came back to reality that I am in a fastfood Mexican chain and not some restaurant. The steak was tasteless and there was nothing amazing about the rice. Even for this price, I wouldn't want to have this again. 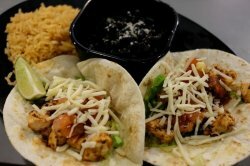 Chicken, Shrimp, Steak Fajitas $14.95. Well, it was pretty much the same as the steak fajitas, just that this had more variety in it. In case you were wondering, they offer 2 choices of tortillas: corn and the flour tortillas. The corn tortilla is just the soft version of the nachos. Personally, I prefer the flour tortilla. All in all, I feel that this was really not worth going to based on the mere two dishes that I tried. 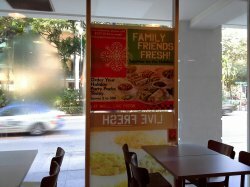 But, please drop down to have a try if you are around that vicinity and craving for some savoury Mexican food. 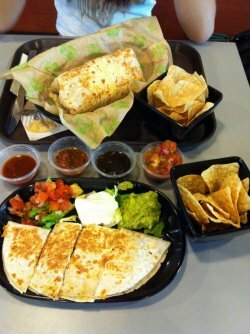 You can try the other dishes like the Burritos and share with us your views on them! The food is a little pricy. I think I about $9 for a chicken burrito. Opted out of the guacamole since I can buy my own avocado and make it on my own, but I would like to see how much of a portion they'd provide. The burrito comes with tortilla chips. There's a salsa bar within the restaurant where you can top up your salsa to dip your chips or even add it to your burrito. There are 4 different levels of spiciness. Honestly, I couldn't really tell the difference in some, but I'd say get a little and try each of the sauces out to figure out your preference. Hope that they have enough business to remain in Singapore! Baja fresh has been quite new in singapore and I was waiting for it to be opened for a few months now but somehow didint get to try it everytime..
so finally.. me and the angmo kia were hungry enough! First thing that surprised me was the price though.. we paid $27 for a salad and a wrap meal- including a small tub of tortilla each, a drink for my bf.. and they were charing extra for guacamole so i didnt take it.. But after seeing the portions.. i think its very worth it.. and even good if u can split it into 2 meals for doggy bag. lookout for more reviews of this place next time! 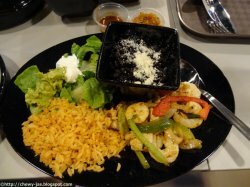 the grill shrimp salad looks good too... im already dreaming of my next visit there.. lol.. The bright and cheery interior attracted my friend and I to have our lunch here before our movie. 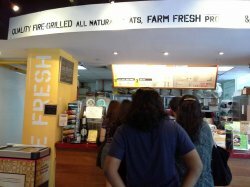 Actually, it feels more like a Mexican fast food restaurant rather than a restaurant because we have to queue up at the counter to order our food. It's also self service for the sauces and free flow drinks. There's four different sauces with different level of spiciness. From mild to medium to HOT. I've tried all four sauces and would like to comment that the HOT one was not as HOT as I imagine it to be. Try all four sauces as they all give different flavors. The mild sauce called Pico De Gallo is not spicy at all. It's made mainly of tomato chucks with onion. I can eat this on its own actually. Ordered a corn and a flour tortillas for our Fajitas. This is also self service as we wrapped what we what to eat on the Tortillas. It's somewhat like the Nan in Indian dishes. My shrimp fajitas. Comes with rice, veggie and black beans. So even if you don't wrapped it up, you can eat it with the rice too. The shrimps taste fresh and chewy to bite. It's quite a balanced meal as the tortillas provides proteins, the rice in small portion for carbohydrates and vegetables for a balance diet. This is a memorable dining moment for me because it's my first time eating Mexican food and the manager is friendly enough to come up, walk to our table and asked if the food is okay. The price is reasonable too.